Form perfect Morse Taper sockets that only hand reamers can provide. 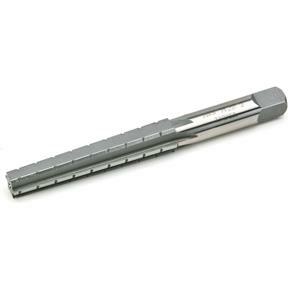 First use the 6-flute roughing reamer, then follow-up with the 8-flute finishing reamer. Flutes measure 3-1/2" long and the overall size of each reamer is 6" long. Made of tough high speed steel. Fits 1/2" square tap handles.